The Oregon Department of Fish and Wildlife’s (ODFW) recent efforts to simplify fishing regulations include several proposed changes for fisheries in the La Grande and Wallowa districts of eastern Oregon. If approved, the new regulations would take effect in 2016. According to the ODFW, the proposed changes are part of a statewide effort to streamline and simply fishing regulations for trout and warmwater fish. The agency has also proposed several changes to some popular steelhead fisheries it claims could increase angler opportunities. In the Northeast Zone, reduce the daily bag limit for trout in streams from five fish to two, and restrict fishing to artificial flies and lures only. Extend the steelhead fishing season to the end of April in Grande Ronde, Wallowa and Imnaha rivers. Increase the daily steelhead bag limit on the Imnaha River to five hatchery fish. Open the Powder River and Burnt rivers to trout fishing year-round. A complete list of the proposed changes is available here. ODFW will be accepting comments through September 4, via email, at odfw.commission /at/ state.or.us. Organizers have confirmed the date of the fourth annual Westport Salmon Tales Festival. 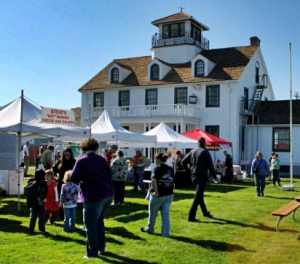 The 2015 event will be held on September 26th and 27th at the Maritime Museum in Westport, Wash.
More information on the Westport Salmon Tales Festival is available at their website. Washington Conservation Corps and Washington Department of Fish and Wildlife (WDFW) staff are in the process of deepening the Dungeness River in advance of the arrival of more than a million pink salmon, the Seattle Times reports. Due to drought conditions, the river has been running at a record low water level. … crews, clad in rubber waders, spent long hours last week under a hot sun using shovels and bare hands to move rocks about, deepening the shallow spots. 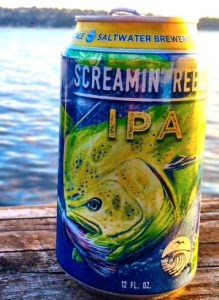 Fishing-themed micro-brewer Saltwater Brewery today announced the launch of its first canned product, Screamin’ Reels IPA. The beer can’s design features a hooked dorado, in keeping with the company’s branding. The names and label designs of most of the Florida-based brewer’s products similarly reflect an ocean aesthetic, like Mola Mola, Smokin’ Red Fish, and Stinger. For now, Screamin’ Reels IPA is only available at grocery and liquor stores in Florida, as well as at Sun Life Stadium during Miami Dolphins games. Steelhead image courtesy Lazlo Iyles (CC BY 2.0).